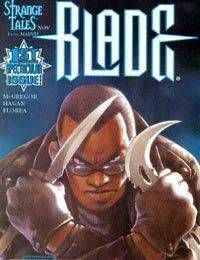 This is the second Blade solo series from Marvel, the first under their Strange Tales banner. Other Strange Tales titles included Man-Thing, Werewolf By Night, and an announced Satana solo title penned by Warren Ellis that ultimately was never produced. The title coincided with the release of the New Line Cinema film featuring Wesley Snipes.